The stock rear brake caliper on the FZS600 is a bit rubbish. It’s an old design and very commonly seizes up, which is exactly what I recently found when getting some new pads fitted. 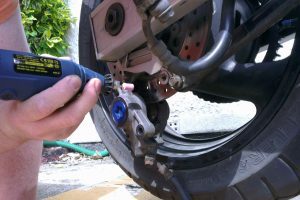 Rather than going down the route of stripping it down and cleaning it on a regular basis, I opted for the popular upgrade of the Fazer 1000 rear brake caliper. This is a ‘blue spot’ caliper, on par with the excellent front brakes I have and same as the R6. Getting hold of a Fazer Thou rear brake caliper isn’t easy, they’re as rare as rocking horse pooh second hand, but luckily I managed to find one on ebay.de for a good price, which included mounting bracket, pads, hoses, master cylinder (from Brembo) and reservoir. For this mod however, only the caliper and pads were used. I gave the new caliper a good clean with Dot4 oil and a toothbrush before fitting as it looked pretty dusty. It came all hooked up, so I was able to test it by manually pumping the master cylinder before fitted it, which was reassuring. 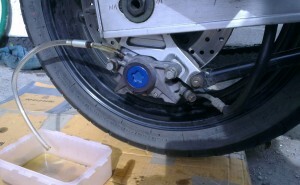 A great guide on cleaning these Blue Spot brakes can be found over at the Bikes and Travels blog. The Blue Spot caliper fits almost perfectly on the FZS600 mounting bracket, however a tiny bit needs to be ground down to accommodate it. Fairly quick work with a Dremal or even manually with a file. The FZS1000 bracket is not compatible, plus we wanted to avoid removing the rear wheel. The new caliper doesn’t sit perfectly central to disc, meaning one piston had to travel further than the other, so we had to slip in a couple of M10 washers to line things up nice. Once bolted to the rear mounting bracket, it was just a case of swapping hose over, flushing the system and bleeding through fresh fluid. …tried two one-way bleed valve pipes and the old school pipe in bottle method. When bleeding we hit problems with the fluid just going back and to each pump. Couldn’t work it out for ages, tried two one-way bleed valve pipes and the old school pipe in bottle method. Then we noticed that the rubber in the reservoir had been sucked down. Hang on, what is this rubber in there? Doh! It’s the rubber seal that should be removed along with cap! Once removed, it was quick work bleeding all the air out and we soon had fresh fluid throughout. In use the brakes are much better, lots more stopping power, although I haven’t locked the back wheel up yet. However, it’s the reliability of these new brakes that really drove the upgrade. Time will tell if they live up to their reputation. A big thanks to my good mate Dave for helping me fit these brakes and explaining how to bleed the brakes. do you happen to know if the rear caliper off an r6 (98-02) is a match? I have to replace the rear caliper on my fzs 600 and i can’t even get a stock one (sh), not to mention a fzs1000 cal. Thanks a lot ! Nope, the R6 caliper won’t fit, mounting holes won’t match up with FZS600 mounting bracket. What about FZ6 rear caliper? Will it fit to FZS 600? 4 years after!! I bought a 1000 rear caliper but the holes do not line up. Are there specific years or summit? For info the holes are closer together!! The holes on the FZS600 mounting bracket do line up with those on the FZS1000 rear caliper. However, there is a little metal on the mounting bracket that prevents it butting up close enough. Have you files this away, either by hand or with a dremel?